MultiPassWord is a reliable application that enables you to keep your passwords and credentials in an encrypted vault file. This provides peace of mind, as you will know your passwords are safe from prying eyes but also that you will never have to memorize them. Please note the tool requires .NET Framework installed in order to run properly. MultiPassWord secures your passwords and login data by keeping them in an encrypted file. You can access the file’s contents using a master password so you only need to remember one instead of dozens. It also lets you organize your passwords into categories and even backup your password vaults. To ensure their security it is possible to setup different master passwords for the backups. 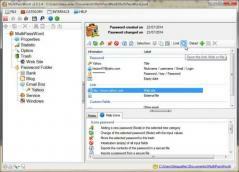 Recovers passwords for RAR/WinRar archives.